Air conditioning thermostat is used in places where the temperature of the space needs to be controlled. You will most probably see some thermostats being installed in hospital rooms, hotel rooms and offices in your daily life. They are usually divided into two categories i.e. mechanical or electronic type. The electronic type can be as simple as the mechanical type but with greater precision and more complex type such as control with programmable timer. The mechanical type is usually simple and can be powered directly from the line voltage. The temperature sensor used is usually bimetallic of which the opening or closing of a valve is determined by the setting of the room temperature. The fan speed of fan coil is usually 2-speed or 3-speed. The accuracy of the temperature is not as critical. Tolerance of 2°C to 3°C is usually acceptable for this type of control. A dead band of up to 3°C is also built into it to prevent chattering (on and off and on again repeatedly) of the valve. It is usually lower in cost compared to its electronic counterpart. The electronic type is more accurate in temperature control (up to 0.5°C) and is usually used when there is a need to automate the entire building management system. The sensor used is usually NTC thermistor of which the resistance increases as the temperature reduces. A digital display is usually available to display the room temperature, the set temperature and sometimes the outdoor temperature. A more complicated system will have error codes that help the users to determine the fault that occurred in the system. The digital display can be LED (light emitting diode) or LCD (liquid crystal display). Most LCD type also has clock display that display the time of the day. The latest air conditioning thermostat that is commonly used in buildings and modern houses is called Programmable Thermostat. 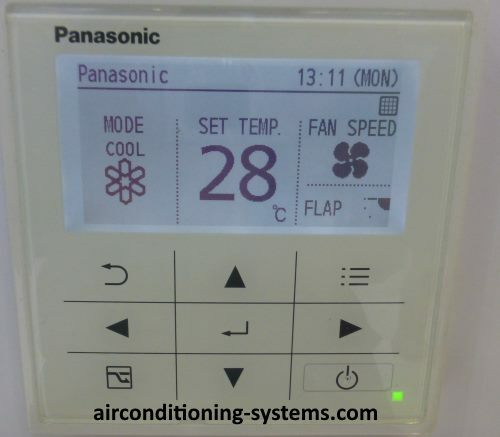 This systems has all the basic features of a simple electronic thermostat but with added features such as the ability to set different settings at different time of the day, night setback mode of which a certain intelligent is built in to conserve energy, holiday mode, change filter indicator and diagnostics mode. If you know the basic of electronics, you may want to see how a typical circuit of a thermostat work. See the schematic and a more detailed description of electronic thermostat project here.